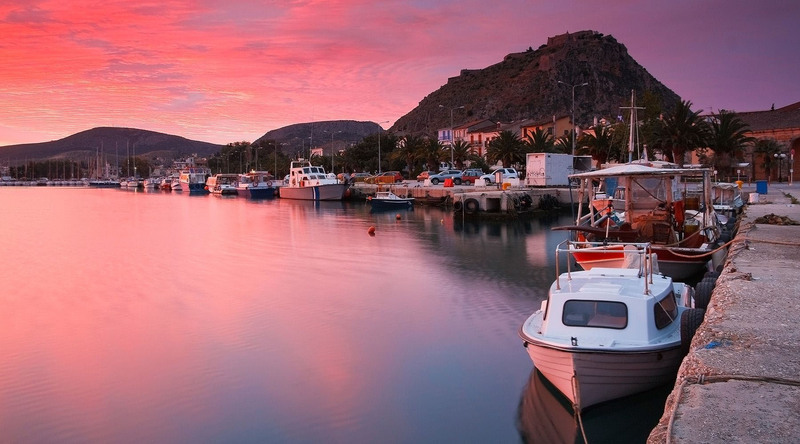 Graced with narrow streets, elegant Venetian homes, neoclassical mansions and plenty of sweeping views of the sea, Nafplio is easy on the eyes. Walk west from the harbor and pass through a rocky arch to discover a stunning view of the 18th century Palamidi fortress. If you’re feeling ambitious, climb the 999 steps (we counted) to the top. To see even more of the picturesque countryside, head to the nearby towns of Mycenae and Cornith. The former features fantastic ruins that were discovered using Homer’s The Iliad, while the latter features a spectacular canal cut from the rocky shores. And if you’re concerned that your Nafplio love is going unnoticed, pick up a strand of kombolois (worry beads), hand-crafted from amber, coral, and horn. There’s no guarantee that you’ll always leave your worries behind once your Azamara voyage is over, but we promise these will make excellent souvenirs for family and friends back home. Proudly standing over 200 meters above sea level, climb 999 steps carved into rock to reach Palamidi Castle. The view alone is worth the climb, but since you’ve done the work, discover the rich history of the castle and area. The most famous of ancient theaters in Greece, the Epidaurus theatre dates back to the 4th century BC. Surrounded by lush landscapes, the theater is marvelled for its advanced design which produces exceptional acoustics. Discover Mycenae, city of Agamemnon, the Greek king who led his troops into battle against Troy, rediscovered in 1876 by German archaeologist Heinrich Schliemann, by using landmarks from the text of Homer’s Iliad. Discover one of mankind’s greatest archeological finds, the ancient city of Mycenae, dating back millennia and home to what many believe is Agamemnon’s Tomb. Embark on a journey back in time through Greece’s magnificent landscapes, to the ancient ruins of Epidaurus. Enjoy a panoramic journey through the Grecian landscape to the wine country of Nemea and a tour and tasting at the renowned Domaine Skouras.